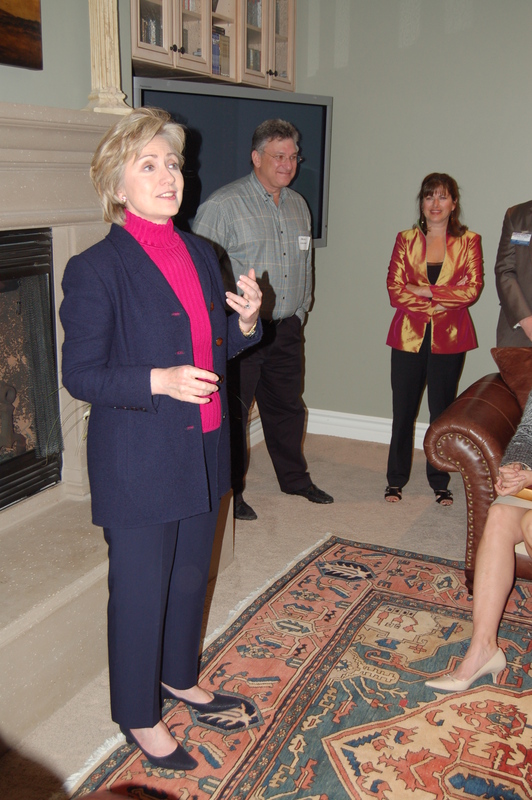 Hillary Clinton visits Laguna Beach in 2007 at the home of Stevan and Rona Gromet. Frank Barbaro’s first political job involved walking door-to-door in East Los Angeles and getting out the vote for Pat Brown, who was running for governor in 1961. Over the next 50 years, he estimates he’s gone on to cumulatively raise $50 million for Democratic presidential hopefuls beginning with John F. Kennedy. Though he stepped away from a formal leadership role he had long held with the Orange County Democratic Party in 2012, Barbaro now is devoting 20 hours a week to making “money calls” in support of the Democratic party’s presidential candidate, Hillary Clinton. If that’s the case, about 370 people committed $2,700 a piece to attend one event at the Montage resort and another 60 wrote checks for $33,400 each to attend a more intimate get-together at the Laguna Beach home of Stephen J. and Chantal Cloobeck, according to Barbaro. Cloobeck, founding chair of Las Vegas-based Diamond Resorts, sold the timeshare operator with 379 destinations for $2.2 billion in June to an equity fund. A 30-year supporter of Democratic causes, Cloobeck is also proud of volunteering as chair of Brand USA, the commerce department’s tourism arm, from 2010-12. Locally, the couple donated to the education support group Schoolpower and sponsored Little League teams. “I’ve been involved with the Clintons since ‘92,” said Cloobeck, who isn’t sure if he’ll be home for Clinton’s visit. “I thought I was done,” said Barbaro, who recently sold his beachfront Laguna Beach condo and moved to Santa Ana, a more bearable commute to his law office. But he’s jumped back into political fundraising “if for nothing more than to secure appointments to the Supreme Court, the single most important thing I can do for my sons,” Barbaro said. His sons Casey and Brett are both physicians, a trauma surgeon and an Alzheimer’s researcher, respectively. Laguna Beach is fertile territory for politicians, contributing about 17 times as much as the average zip code, according to opensecrets.org, a website tracking political fundraising. So far in 2016, the town’s residents wrote $1 million in contributions, the site says. Among recipients, Clinton leads with $147,069 so far from 92651, with Rep. Loretta Sanchez and the Republican National Committee coming in second and third, the site says. Gary J. Daichendt is listed as the town’s largest donor, the site says. He made a $35,000 contribution last November to Pursuing America’s Greatness, a super PAC that supported former Arkansas governor Mike Huckabee for president. Rafiei, a former executive director of the county’s Democratic Party, said the Laguna event will be Clinton’s second in the county since June 2015 when the former secretary of state greeted supporters at the Balboa Bay Club. “We’re told to be there and we go,” she said of the volunteer hosts, who take their direction from the Clinton campaign committee. “We know full well this money will be spent in swing states,” Rafiei said. While local police expect the Secret Service to involve them eventually, Sgt. Tim Kleiser said as of midweek no assistance has yet been requested on behalf of the Clinton campaign. Judging from previous visits, residents near the resort can anticipate the candidate’s arrival when helicopters start circling and hours before Secret Service agents with dogs forbid the exit or entry of people to the area, recalled resident Marlene Baker, who hosted a fundraiser for Clinton 16 years ago when she was first lady and campaigning for a New York senate seat. “We were very popular with our neighbors,” said Baker, who remembered during the lockdown her own lack of privacy, curling her hair in the presence of Secret Service agents as they combed through her home and outdoor landscaping. In 2007 when Clinton first sought the presidential nomination, she made another fundraising stop in Laguna Beach at the home of Stevan and Rona Gromet. Then mayor Toni Iseman along with two school administrators attended the $2,000 a person, 90-minute event. At the time, Baker’s former husband, Terry, served as Southern California fundraising chair for Clinton and organized eight similar events in the area. This time, Baker said she isn’t attending. “I love her, but I have to put a kid through college,” she said. It is good to see that Clinton is holding fundraisers in Laguna Beach. Laguna Beach has a reputation as a ” liberal bastion” in Orange County, where the John Birch Society was founded and is still influential in Laguna’s local government. Regarding the Bigoted, RACIST Donald Trump, also known as Putin’s BFF and Pravda’s American mouthpiece, does he plan to campaign (LIE) in Laguna Beach like he did in Irvine earlier this year. 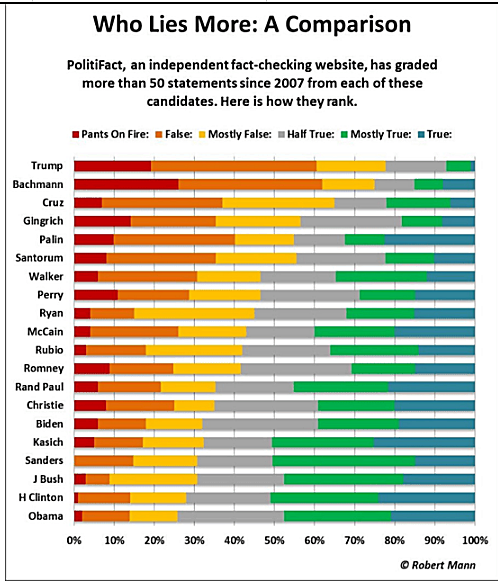 THE Donald has a lot of nerve calling Hillary a Liar, when more than 75% of his statements have proven partially false to outright LIES by fact checkers. Biggest LIAR, least qualified candidate to run for President EVER! He is scary; even scarier than Goldwater, who was the Republican candidate when the Birchers( the KOCH brother ol man was a founding member) were founded. What is it with Republicans with their love of Fascism and their last two elected Presidents being heirs to the LAST Nazi banker in America? I should have included this with my last post. My Bad! Looks like I was low on the % of his lies. Second link shows chart; I can’t seem to paste it. Who’s lying: The chart or Putin’s BFF? Trump lies so much that in 2015, Politifact awarded him the Lie of the Year for numerous statements he made, because the team couldn’t pick the most egregious lie. Out of 77 statements checked, 76 of them were found to be mostly false to false to pants on fire lies. What does it mean that the man who tells the most lies is the most popular with the Republican base?